Scientists at Massachusetts Institute of Technology (MIT), University of Minnesota and University of California at Berkeley have experimented with a technique that studies small samples of bacteria and gauges a specific property that is related to their ability to produce electricity. Their paper published in the journal Science Advances he says the technique is known as micro fluidic dielectrophoresis and the property is known as polarisability. 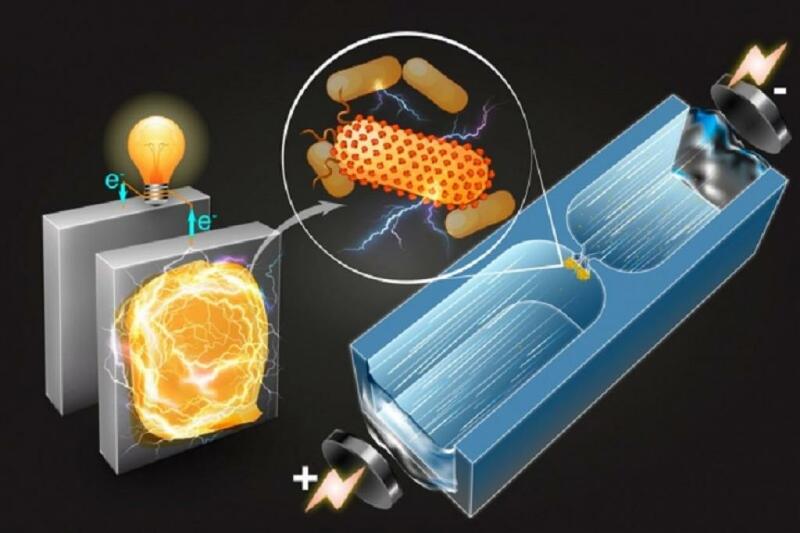 But the fact that bacteria can produce electricity and that it can be harnessed by energy generation systems has been known for quite some time. For instance, in as far back as 2003 Daniel Bond and Derek Lovely had showcased how the Geobacter sulfurreducens bacteria can be used to generate electricity by creating microbial fuel cells. Lovely is also credited with discovering the bacteria in 1987. While many of these bacteria live on the bottom of lakes and on the sea bed, last year scientists were shocked to find that some of them also live in our guts. As these tiny power plants are much smaller than human cells, analysing their exact electrical properties has been difficult. But now the MIT scientists have made headway on this subject with this research. As part of their technique, the researchers mounted and channeled the bacteria on microfluidic chips that they developed in the last 10 years. Then they subjected the bacteria to an electric field. But in the middle of the chip there was an enhanced electric field to create a gradient with the surroundings. The scientists did this by pinching the middle of the chip, reducing its width by 100 times. The gradient of the electric field creates a phenomenon known as dielectrophoresis, or a force that makes the cell move in a direction opposite to that induced by the applied electric field. Based on the polarisability of the bacteria (electrical properties of their surfaces) they either get repelled or stopped in their tracks. The ones which had higher polarisability were also found to be electrochemically active. This, in turn, could become a source to identify the bacteria that have useful electrical properties. The research group studied many strains of bacteria including bio engineered ones and detailed their electrical properties. Bacteria produce electricity by a process known as extracellular electron transfer (EET). The microbes do this by generating electrons within their cells, then transferring them across their cell membranes through tiny channels formed by surface proteins. Some bacteria even form long surface proteins and extensions to build a network of electricity producing bacteria, especially those living on river banks. The other prevalent techniques for studying bacteria’s electrochemical activity either involved culturing large colonies of cells and measuring the activity of EET proteins which takes a long time or need the breaking open of a cell, taking out the proteins, isolating and studying them. The scientists were thus looking for a faster and less invasive technique. Scientists had previously used dielectrophoresis to identify general characteristics like size and species of bacteria but this was the first time that a property as subtle as electrochemistry was studied through this technique. The researchers also indicated that the types of bacteria which were electrochemically active could be much greater in number. They are studying these new strains of bacteria using the microfluidic dielectrophoresis technique. “If the same trend of correlation stands for those newer strains, then this technique can have a broader application, in clean energy generation, bioremediation, and bio-fuel production,” said Qianru Wang, one of the authors of the paper and a post doctoral researcher at MIT.